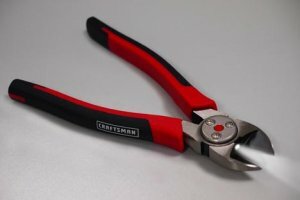 Craftsman introduced a full line of lighted pliers at the Consumer Electronic Show, and though they come too late to help me with my repair, I am sure they will be a help to people in the future. The Craftsman Lighted Pliers feature a center hub that houses an LED light that focuses light directly onto the work surface. The hub is designed to pivot with the jaw to make sure that it is always pointing in the right direction and holds the 3 replaceable #392 watch batteries that are said to provide the oil-proof and water sealed LED with "Extra-long" battery life. Coming June 2012, Craftsman will be selling Lighted Needle Nose Pliers, Diagonal Cutters, and Linesman Pliers for $19.99 each. A two piece combo pack consisting of Lighted Needle Nose Pliers and Diagonal Cutters will also be available for $29.99.